Arsenal are very unlikely to sign someone despite their lack of a potent striker after Oliver Giroud have been ruled out for 4months. 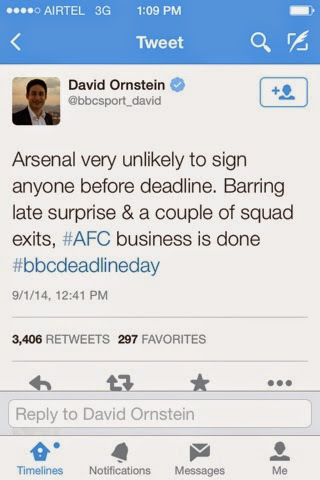 Ever reliable BBC sports, David Ornstein shared a post on twitter killing the hopes of a surprise last day signing by the gunners. This has caused major uproar by arsenal fans on the social media. There's still time to make some moves though, it is too early to write off a major signing by the gunners.